Our LED Venue mood Uplighting service is suitable for a wide variety of events. Using modern LED. Lighting & Computer Controlled technology we are able to select any shade of any colour you may desire. Which can be used to paint your venue with light, thus creating the perfect atmosphere. LED lighting this doesn’t get hot so it’s safe to use in marquees and around small children. Designed to complement your choice(s) of colour scheme at the touch of a button. 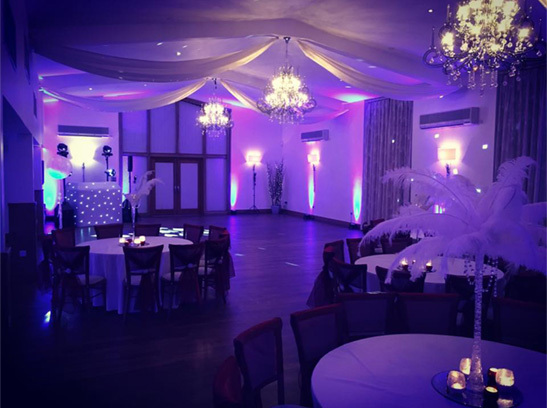 Our Wedding Lighting service can transform your venue into one standard colour or a mixture. So if you was thinking of using this for your Wedding this would be ideal if you have a certain wedding colour theme. We will install our venue lighting effect well before you are due to occupy your function site. If you choose to have the lighting on a static colour we can program the lights to slowly fade between the colours of your choice. This lighting is also perfect for use in a chillout room if your guests want to chat, relax and have a break from dancing.